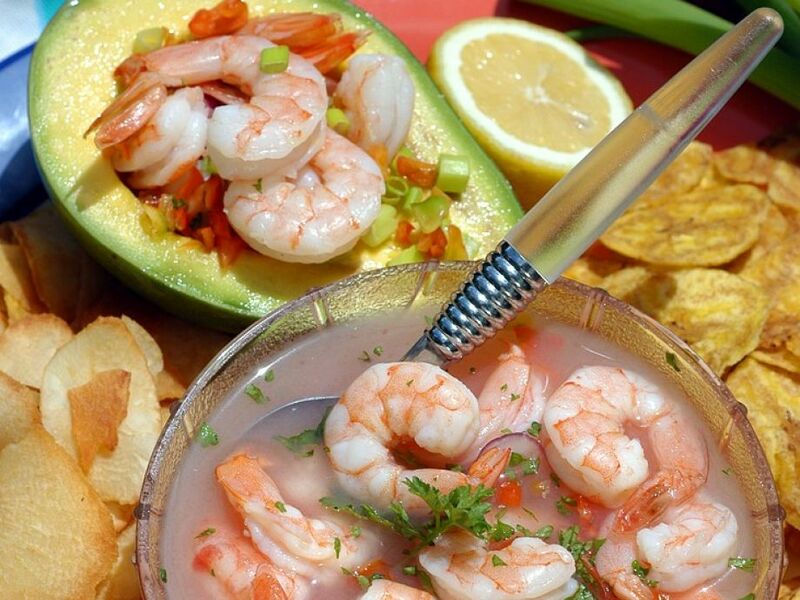 1 In a bowl, layer the shrimps, the shallot, diced spring onions, and the finely sliced celery. Add the bay leaf. 2 Mix the oil, vinegar, white wine, capers, salt and pepper to make a marinade and pour over the shrimps. Make sure they are covered with the liquid. Cover and leave in the refrigerator overnight. Turn the shrimps every now and then and spoon the marinade over. 3 Mix the cocktail tomatoes with the with the diced peppers and the chilli pieces. Halve the avocado, remove the stone and drizzle the flesh with lemon juice. 4 Fill each avocado half with the pepper, tomato and chilli mixture. Take the marinated shrimps out of the marinade and place on top.